The first stages of development of a new two-seat all-weather long-range interceptor for the RCAF began in early 1953, at the time when the RCAF was busy forming its first CF-100 squadron. By April 1954 Avro's design team was involved in the manufacture of the first five Arrow 1 prototypes. The CF-105 featured a true delta-wing design fitted with twin turbojet engines. The aircraft would be piloted by a crew of two, made up of a pilot and his radar operator. 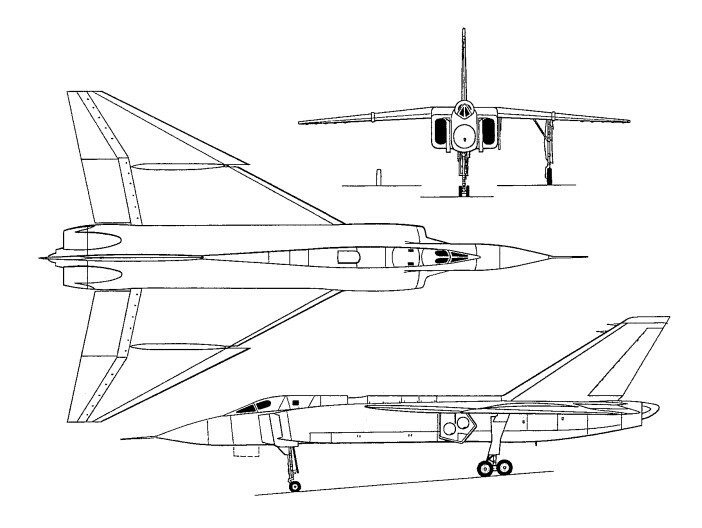 Avro made the decision to design the CF-105 as a pure delta wing platform. The aircraft's single-minded interceptor purpose was to travel in straight lines, finding the fastest way to get to its target in the shortest amount of time. The increase in drag was offset by the added fuel that could be stored in the wings as the CF-105 system would be expected to feed two thirsty turbojet engines, each with afterburner capability. The Orenda Iroquois - a highly advanced engine for its time - was selected as the powerplant that would propel the CF-105 Arrow for decades to come. This had a needle-nose, widening just aft of the cockpit, where intakes on each side of the fuselage fed air to two turbojet engines mounted side by side within the fuselage. The Arrow 1s were powered by two Pratt & Whitney J75s, but it was intended that the following Arrow 2s would have engines of indigenous design and manufacture, in the form of PS-13 Iroquois turbojets, developed by Avro's Orenda engine division, each of which promised a thrust of 12700kg with maximum reheat. The two-man cockpit was held well-forward in the design, protruding between the two rectangular intakes to either side. The intakes ran the length of the fuselage and the delta wings extended from the installations as high shoulder-mounted assemblies. The aircraft's layout ended with the twin engine outtakes at rear capped by a single vertical tail fin set between the two engine compartments. The main landing gear extended from the wings (another benefit of the delta wing concept) as opposed to the fuselage body with two wheels to a gear (in single file arrangement). The nose landing gear leg retracted into the fuselage just behind and below the cockpit. The Arrow appeared in its first form as the Mark 1 with production approved by 1955. The first Arrow completed October 1957, became model RL-201 and this aircraft was fitted with lower-powered Pratt & Whitney J75 series engines while the Orenda brand series were completing development. The unveiling was intended to be a huge affair but the successful launch of the Soviet satellite Sputnik destroyed any hope of that and in many ways forecasted the future of the CF-105 program itself. Several other delays of the internal systems added to the already bumpy curtain-raising event. The first was first flown by Jan Zurakowski on 25 March 1958, this Mach 2 all-weather fighter had a continental radius of action and could operate up to 70,000ft. It achieved 1,000 mph on its seventh flight. The two underfuselage speed brakes could be held open during Mach 1 flights. Four more Mark 1 soon followed. Over the months of testing, a major issue arose with the complex main landing gear arrangement. The design relied upon the two main single-file landing gear wheels to fit into the wing. This necessitated that the gear rotate before settling fully into the thin delta wing design. After addressing several of these key issues, the five CF-105's were moved out of the A.V. Roe internal company test program and forwarded to official military trials beginning 1959. By this time, the future of the CF-105 was already highly in doubt. 1957 saw a political turn in Canada which the new conservative-leaning party began targeting the spending projects of the former liberal party. The CF-105 was not immune to the discourse and when the Americans came calling with their NORAD (NORth American Air Defense) initiative and its thousands of available aircraft for use across Canadian air defense. It was seen fit to cancel the CF-105 Arrow project altogether on 20 February 1959 by John Diefenbaker, a Prime Minister of Canada, after expenditure of about $400 million. It is estimated that an astounding 50,000 jobs were lost with the cancellation of the program - or about 80% of Avro Canada altogether - permanently damaging the Canadian aerospace industry. The prototype and six more airframes were sliced up, crushed and burned. Three years later Canada had to buy McDonnell F-101 Voodoo fighters from the USA. Engines: 2 x Pratt & Whitney J75-P-3, 47,000lbs thrust.